The June Interzone features an original feminist parable from Rachel Swirsky, “Heartstrung”. The arresting central idea has girls removing their hearts and sewing them to their sleeves as they pass to adulthood – and in the process (differently than the figure of speech “heart on one's sleeve” implies) become distanced from their emotions. At Electric Velocipede for Fall ... Rachel Swirsky has really made a splash with her first few stories, and “How the World Became Quiet: A Post-Human Creation Myth” is another strong outing. It is a story of the far future, when the trees unite to eliminate humanity – though humans change in unexpected ways. 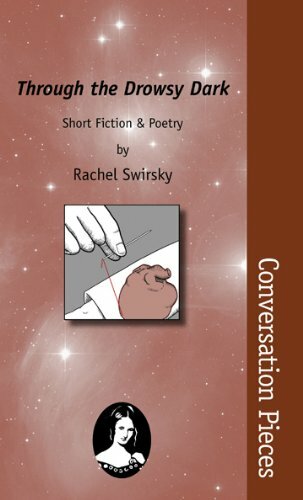 Rachel Swirsky is a very exciting new writer, and at the March-April Weird Tales she offers another of her short, intense, stories – and each I’ve seen from her has been unique. “Detours on the Way to Nothing” is a very odd account of a strange sort of creature arranging an encounter with a man. Everything about her is odd: feathered hair, voluntarily removed tongue, mysterious sudden appearance – but “her” story, or lack thereof, is the philosophical center of this piece. One of those stories I’m not sure I understood at all, but that still fascinated. Which is a specific kind of “weird”, and one that seems definitely a goal of new editor Ann VanderMeer. In June’s Fantasy Magazine ... Rachel Swirsky is as ever interesting, and as ever original, and as ever trying a different tone, as she too looks at a human woman marrying a god. But “Marrying the Sun” is not dark, but an amusing and deadpan look at the problems of a relationship with the Sun – things like your wedding dress going up in flames. At Tor.com in April one oustanding piece is Rachel Swirsky’s “Eros, Philia, Agape” (March), which retells an old tale: an intelligent robot (here created to be a lover for a rich woman) yearns to be free. Where the story shines is the sort of freedom he craves – Swirsky depicts the protagonist magnificently, convincingly a created intelligence, and yet his own person, and yet not a human, exactly. If Baen’s Universe is closing, another publisher-associated site, though with a quite different structure and business model, seems to be doing quite well. Tor.com continues to feature excellent work, including in November an atmospherically sad Rachel Swirsky story, “A Memory of Wind”, which tells the story of the sacrifice of Iphigenia from her point of view. Swirsky is also impressive at much shorter length at Beneath Ceaseless Skies for October 22. “Great Golden Wings” is a lovely little story, very simply told – a “cinematographist” trying to get financing for his invention against the resistance of people like magicians – who think movies might be competition for their illusions – is showing his early film (of dragons) at court. One court lady is enchanted – others merely hope to gain social points. I liked the introduction of a technologist into a fairly standard-seeming fantasy world, and I liked the depiction of the wonder felt by Lady Percivalia, and her trapped characterization. Rachel Swirsky has also not published a novel, and I don’t know of any forthcoming. But her short fiction continues to excite readers, and indeed two separate novelettes from 2009 ended up on award ballots (“The Memory of Wind” for the Nebula, and “Eros, Philia, Agape” for the Hugo). Through the Drowsy Dark is a strong mix of fiction and poetry. Several of the stories are new to this volume, and are well-done – but not SF or Fantasy. The story unfamiliar to me that most impressed me may be unfamiliar to many readers: “The Debt of the Innocents” first appeared in the 2007 UK anthology Glorifying Terrorism. It’s strong SF, positing a future in which energy shortages doom many poor babies to unnecessary deaths because of lack of incubators. The viewpoint character is a nurse who joins a terrorist movement to resist this. The story doesn’t really insist on taking a side, though it presents its arguments in a curiously asymmetric fashion. The effect in the end is quite powerful. Rachel Swirsky contributes a novella to Subterranean Magazine’s Summer Issue, their “Special Novella Issue”. “The Lady Who Plucked Red Flowers beneath the Queen’s Window” is, as far as I can recall, her longest published story (and longest title!). It does show signs of structural strain: it has a decidedly episodic structure, a common solution, I think, used by writers extending to greater lengths than they are used to. But it still works. The title character, Naeva, is a loyal servant (and lover) to her Queen, but she is killed in the Queen’s service. However she is preserved as a spirit, to be brought back magically to give advice, at first to her Queen, but eventually to future – even very far future – generations. This is a bitter pill for Naeva to swallow, not least because of what she learns about her Queen. It becomes still bitterer as the future changes, and as her culture is forgotten, and she must put up with such abominations as cultures in which men have status, and indeed in which women love men. The story slingshots farther and farther into the future, lightly touching on a variety of fantastical (and even rather SFnal) cultures, and touches at transcendence by the end. Excellent work. In Eclipse 4, I really liked Rachel Swirsky’s “Fields of Gold”, about a young man who finds himself in a strange afterlife, complete with famous people, and a few people he knows. He quickly gathers that one of the people there is his estranged wife, who may have murdered him, but perhaps more important to him is his cousin and childhood best friend. The story is part about why and how he died, and why and how he more or less wasted his life; but it’s also about what really made him happy, and the ending is quite moving and ambiguously hopeful. Rachel Swirsky’s “The Taste of Promises” is a again about a kid putting himself in extreme danger. Tiro runs away from his Martian city with his brother – who we quickly learn has been uploaded due to a disease – and ends up at another city. He hopes to find a way to get his brother a body, but he must learn to understand what his brother might really want. And deal with pirates, too. Finally, there's a new horror magazine out, The Dark, edited by Jack Fisher and Sean Wallace. The first issue features four well-written stories, all by women, the best and strangest of which is Rachel Swirsky's “What Lies at the Edge of a Petal is Love”, which is more “weird” than “horror”, about a man who finds his wife (and children) becoming plants. In the Summer Subterranean, Rachel Swirsky's “Grand Jeté (The Great Leap)” is perhaps her longest story yet, and very good, about Mara, a girl dying of cancer, and her reactions (and her father's, and her replacement, called Ruth) to her father's making an android version of her, into which her personality is downloaded. Seems creepy, but by the end the story – and the characters – come to terms with this. It's a powerful story of character, interleaving Jewish themes (the golem, Jewish festivals and prayers, the Holocaust) with the ballet (Mara's mother was a ballet dancer, and the story alludes strongly to Coppélia), and with science fiction and AI and identity. The best fantasy in the December Lightspeed is a playful take on Alice in Wonderland by Rachel Swirsky, “Tea Time”, about the March Hare and the Mad Hatter, lovers in a time-stopped Wonderland. The main interest in this case is the extended and effective prosodic whimsy. Also interesting in the February Clarkesworld is “Between Dragons and Their Wrath” by An Owomoyela and Rachel Swirsky, told by Domei, a 14-year-old in a war-torn land, gathering dragon scales despite the danger of uncontrolled changes. Change – forced and unforced, and otherness, and of course the detritus of war is central to this moving story.